The facade of the Gurgaon headquarters of Bharti Airtel grabs the attention of night commuters on the Delhi-Jaipur highway that runs in front of the building. Some would call the red and white horizontal stripes across the building, when lit, bright. Others would say they are garish. But step into the concourse and you have the stunning sight of a fivefloor, 60-ft high mural of a wellgrown tree on a bright yellow and orange background. At night, its design - by artist Manav Gupta - is meant to contrast with the rest of the building of mostly open space offices, stark in its plain glass windows and white lighting. Such a contrast, curiously, is playing out in the lifecycle of Airtel, as the largest telecom company in India is commonly known. It has had a brilliant history racing to the No. 1 spot by telecom revenues and customers in India , after shedding a legacy of small-time trading and manufacturing. A history of bold moves that redefined the industry with an extreme outsourcing business model, a consumer goods-like penetration in distribution and never-before low user tariffs. All of which built a business that was at its peak ranked shoulder-to-shoulder with India's most valuable firms, Reliance Industries and Oil and Natural Gas Corporation, giving it muscle that it flexed in taking an audacious leap into Africa, arguably the next big and last emerging market. Today, though, things are dark for Airtel. From March 2010, its profits have nearly halved. In the April-June quarter just gone by, the company's profits after tax have shrunk 28 per cent to Rs 1,215 crore from a year ago. This was a result of competitors pulling down user tariffs to as little as 30 paise a minute and interest costs mounting on its $10.7 billion acquisition of networks in 16 African countries from Zain, a Bahrain-headquartered company. Sanjay Kapoor, CEO for Bharti Airtel's India operations, thinks he knows how to return Airtel to its glory days: a reorganisation of the company that all but upturns the structure it has created in its 17-year history as a mobile phone services firm. This reflects the change in business strategy from being a voice-centric company to one that is in "life enrichment and data services", says Kapoor. "A transformation of this scale by putting all businesses together and giving them a customer perspective is probably the biggest change we have carried out in the past decade." At its core, the restructuring, which got underway August 1, appeals with its simplicity: do away with silos that sold the company's three main offerings of mobile phone services, broadband and direct to home, or DTH, TV service through separate CXO-level business heads. Instead, integrate them into a common go-to-market team divided under three regional heads - each reporting to Kapoor, instead of the earlier business heads - covering all of India, Bangladesh and Sri Lanka. In effect, the same team will sell the three services. "The customer does not see us as mobile or telemedia (broadband) or DTH; he sees us as Airtel," says Kapoor, who is seen in the company as a driven roll-yoursleeves-up doer even if not a great people person. 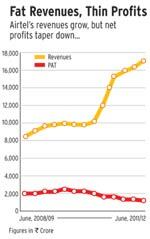 The mobile, broadband and DTH TV businesses make for more than 90 per cent of Airtel's revenues of Rs 59,467 crore in 2010/11, including Africa sales. Kapoor, who joined Airtel in 1998 from Xerox India and ran West India as a region for the company in his early years, believes there are significant synergies to be harvested from the reorganisation. 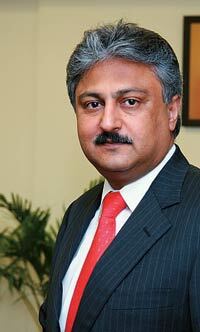 "HR, finance, support, SCM… there are lots of synergies to be had," says Kapoor. "What applies in mobile can be applied in fixed line and DTH, and then the reverse can happen." He will not be pinned down on the effects of the change - stock market rules do not allow publicly-listed Bharti Airtel to make statements that may have a bearing on share prices - but says changes will be seen in six months and he expects a "multiplier effect" on operations. Analysts think the reorganisation makes sense if executed well. "It helps you get some efficiency in the processes and save a lot of cost," says Shobit Khare, a telecom analyst at Mumbai brokerage Motilal Oswal, who tracks the company daily. Industry executives say the reorganisation is not a day too early. Airtel has "not been able to align its business properly. Businesses like DTH are not doing quite well; even the fixed line business is not making too much," says a senior executive at Idea Cellular, insisting on anonymity. The Idea Cellular executive also points to the large number of employees Airtel has. Kapoor and his team have been working on bringing staff numbers down but it is still a work in progress. In the last 13 quarters, Airtel's headcount has gone down by more than one-fourth to 16,545 employees from 26,144. The Idea executive points out that the company is still overstaffed: "We operate with only 7,000-odd people." If benchmarked by Idea's subscribers to staff ratio of 13,500, Airtel should not have more than 12,500 employees. That is, it has about 4,000 people in excess. Newspapers have reported that Airtel expects to let go about 2,000 employees in the current restructuring but Kapoor will not confirm the number. "Whenever you do any such reorganisation, some roles get redefined and recalibrated, roles become much larger, and roles become redundant," he says. He expects that for the majority of Airtel staff, roles will become larger, and for some roles might change. The big picture for Kapoor is that the company will become agile as it removes layers for faster decisionmaking. There were seven layers between him and the sales agent pounding the street; now there will be five. Pull to a 10,000-ft high view and a bigger picture emerges: a war among phone operators for market share triggered by newcomers to the industry hungry to get a toehold in a market of nearly 600 million customers. Entrants such as Uninor and MTS are making do with an average revenue per user, or ARPU, of as little as Rs 45 a month, impacting even market leaders such as Airtel, which see their monthly per customer billings shrinking to Rs 190 from about Rs 280 in June 2009, a few months before the price war started with Tata DOCOMO introducing its per second billing plan. Kapoor and other incumbent mobile phone operator CEOs have complained that how there are too many phone firms in India - 13 at last count - and maintained that newcomers are not even covering their marginal costs of operations. Companies across the industry have in recent weeks started raising tariffs on pre-paid plans. On some plans, the increase is as high as 20 per cent, with hopes in the industry that this will stop the continuous downward slide in ARPU. But the analyst community is not convinced this will last. "We think the recent tariff hikes will not sustain beyond two to three quarters," Jyotivardhan Jaipuria, research analyst at DSP Merrill Lynch, wrote in August in a report on Bharti Airtel. Airtel has other cost control measures in play, as well. The company has crimped on the money being pumped into marketing channels. Distributors and Airtel rivals say the company has reduced dealer margins by more than five per cent - 0.5 to 0.8 percentage points. The message is clear: the company wants to concentrate more on high ARPU customers and not on the churn in the market, which typically is of low ARPU yield. (Kapoor says such a minor decision on distribution margins would normally not come up to his level and that he is not aware of it.) Kapoor says Airtel is a "people independent" company but the reorganisation he is leading is by far the biggest challenge in his professional life as a CEO. And he will have to deliver the transformation virtually alone. Other leaders of the company, such as Group Chairman Sunil Mittal, Deputy Group CEO Akhil Gupta and Manoj Kohli , now in charge of Airtel in Africa, are busy a continent away - turning around the company's Africa operations.